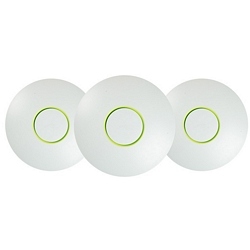 The clean design of the UniFi 802.11b/g/n access points seamlessly blend into typical home and office environments. With 300Mbps MIMO technology and a range of up to 400 ft., these access points include everything you need to install and manage them. Power over Ethernet (POE) functionality makes for both a cleaner and easier install. configure and manage all your UniFi access points with the included easy-to-use controller software. Sold as a 3-pack. Includes 3 access points, 3 mounting kits, 3 PoE injectors, 3 power cords and CD-ROM with software. Management station requires Microsoft Windows XP+ or Mac OS 10.4+. Pros: Setup was fairly easy. Hardware install easy. Configuration once setup easy. Other Thoughts: Great product, does very well. I have two APs up and running now, with approx 50 users connected and no wireless issues with clients. Setup, change of config and wifi security is very easy with the controller. Sadly, controller can not be connected to the network via AP, will not connect. Must be hardwired or connected via different AP hardware to see services review / users review. Very happy with these. I normally use Cisco hardware, but will give these a bit more load to see how they work. Overall, very happy with coverage and service provided.